Remaining active and social impacts the physical health of seniors in some surprising ways. May happens to be Mental Health Month and Physical Fitness Month, and as a leading provider of in-home care in Harrisburg, we’d like to devote this blog to discussing how staying social affects overall senior health. Cardiovascular diseases, including heart disease and stroke, are one of the most common health risks. A 2013 study published by the Association for Psychological Science showed that along with diet, medication, and moderate activity, social connections contribute to a healthier lifestyle and better risk management. This is because having a social life encourages seniors to engage in other healthy behaviors, including walking and better food choices. In a 2015 presentation by the American Heart Association, recommendations were made to utilize technology, such as social media, to provide access to social connections that support heart health. A series of studies by the Drexel University School of Public Health show that socially active seniors are more likely to participate in preventative care, including regular cancer screenings to detect possible problems earlier when there is a better chance for successful treatment. The component of open discussion of necessary tests and treatment options while socializing with peers can reduce fears and concerns that sometimes lead seniors to put off care. An additional benefit the Drexel University studies uncovered is a sense of connection. Seniors say that they feel more supported when they have friends near their own age and this decreases depression and loneliness. A joint study by the University of Michigan and University of Denver showed that socializing helps keep memory and other mental faculties sharper and sometimes even leads to better physical mobility. This may increase a sense of independence as well, which is another key to lower stress levels. Ultimately, seniors who are engaged in social activities express overall greater satisfaction with their life quality. If your loved one’s social calendar has taken a hit because of mobility challenges or the loss of his or her driver’s license, a Harrisburg caregiver from Home Care Assistance can help. 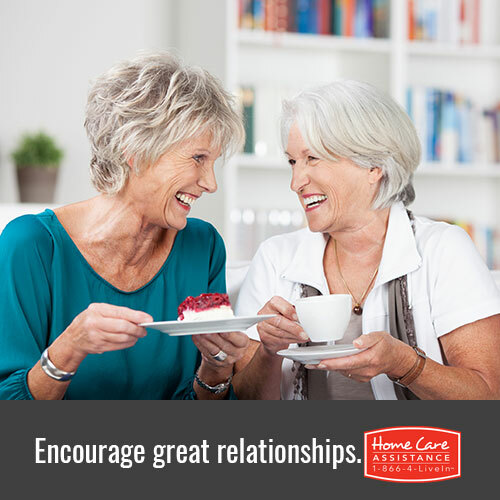 Our friendly and experienced caregivers can provide transportation, offer mobility assistance, assist with errands, cooking, and light housework, and offer consistent companionship. Call us today at (717) 540-4663 to schedule your free consultation with a helpful Care Manager. Why Should Seniors Have Balanced Lifestyles?